This book engages the view that students of International Relations need to break with the habit of defining power in terms of military capabilities of states. Featuring contributions from both upcoming and distinguished scholars, including Steven Lukes, Joseph Nye, and Stefano Guzzini, it explores the nature and location of `power' in international politics through a variety of conceptual lenses. 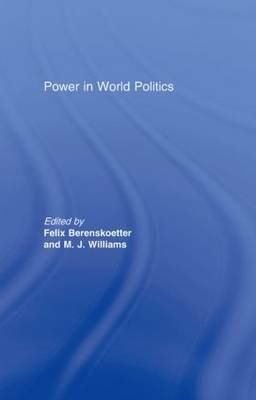 With a particular focus on the phenomenon of `soft' power and different types of actors in a globalizing world, fifteen chapters assess the meaning of `power' from the perspectives of realism, constructivism, global governance, and development studies, presenting discussions ranging from conceptual to practical oriented analyses. Power in World Politics attempts to broaden theoretical horizons to enrich our understanding of the distribution of power in world politics, thereby also contributing to the discovery and analysis of new political spaces. This is essential reading for all advanced students and scholars of international relations. Power is perhaps the most basic concept in the study of world politics, but also the most elusive. Power in World Politics substantially enhances and broadens our understanding of power by bringing together accomplished scholars from varied theoretical perspectives to explore the sources and forms of power in a changing world. Drawing from a variety of International Relations' traditions and other fields and disciplines, this book contains some of the most cutting-edge and illuminating scholarship on power yet. It is no exaggeration to say, therefore, that after reading this book you will never think about power in simplistic and one-dimensional ways. Power is one of the most important, but also most ambiguous, concepts in Political Science and, more specifically, International Relations; this fine collection of original essays by a mixture of senior figures in the field and members of the new generation of scholars may not eliminate these ambiguities altogether, but it does illuminate the concept more effectively than any other book published this century. A fine achievement.